Turf toe is a term used to describe a sprain of the ligaments around the big toe joint (metatarsophalangeal joint). 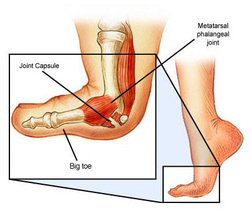 It occurs due to hyperextension of the big toe upward. This type of injury is common in soccer players and dancers because of their flexible, unsupportive shoes. Turf toe is a common injury in football players who play on the artificial surface, turf. Turf is more firm than grass and therefore cleats are more likely to become stuck. When a player is tackled, the foot then stays planted on the ground while the body moves forward, hyperextending the joint. It is the association of this injury with football players playing on turf that gives this condition its name. Although it is a common athletic injury, it can occur in any situation that causes excessive motion of the big toe joint. The joint may appear red, swollen and bruised, depending upon how badly it was sprained. A Chiropodist can assess the toe, assess the shoes, modify the shoes or recommend new shoes, provide information to help prevent future injury and decrease inflammation, give rehab exercises, tape the toe straight, and prescribe orthotics or anti-inflammatory medication (NSAIDs), if necessary.